Sant Jordi (Saint George) is the patron saint of Catalonia and his day is duly celebrated on the 23rd April every year. However, unusually, the celebration is not a bank holiday. This is because it is apparently feared that the citizens of Barcelona cannot be trusted not to turn a bank holiday into a “puente” (literally “a bridge” but in this context in a long weekend) and to rush off for a brief vacation. 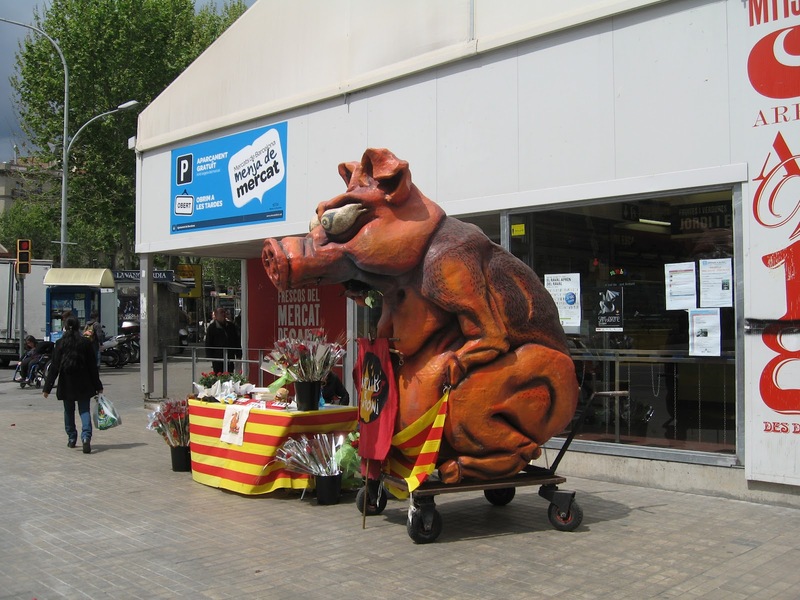 The thought of encouraging Catalans to desert Catalonia at a time when they should be celebrating it is far too upsetting for the powers that be. So it is a normal working day. Well not strictly a normal working day because somewhere back in the mists of Catalan history it seems that someone got St George’s Day and St Valentine’s Day mixed up (it’s easily done – there are a lot of saints to remember and they are easily confused having usually been martyred in similarly extremely undignified and painful ways). 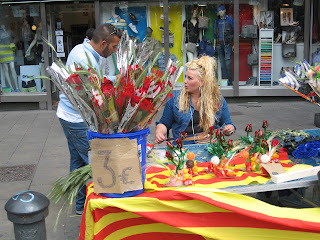 So, now it is traditional for couples to exchange gifts on Sant Jordi. 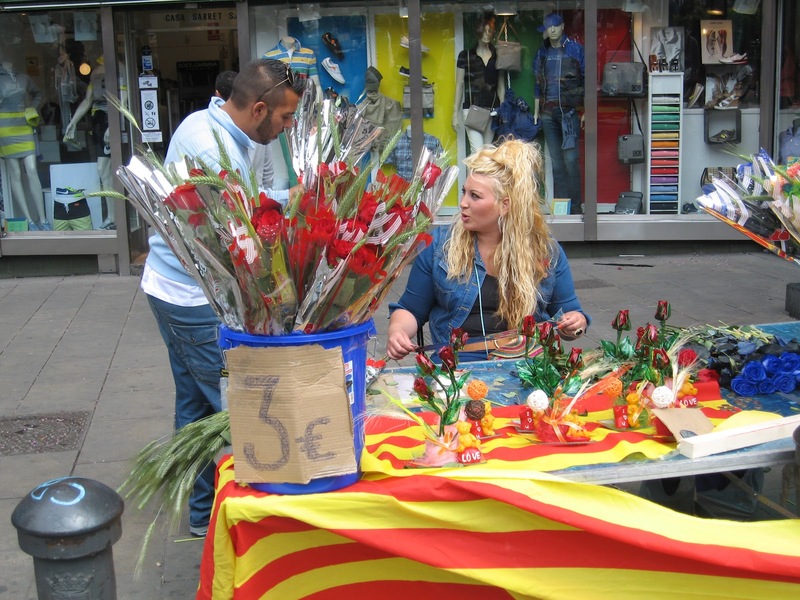 How single people are supposed to celebrate Sant Jordi is not made at all clear. Sympathising with the dragon, I suspect. The girls/women must be given a rose. And the boys/men must be given a book. Now there are good things and bad things about this. 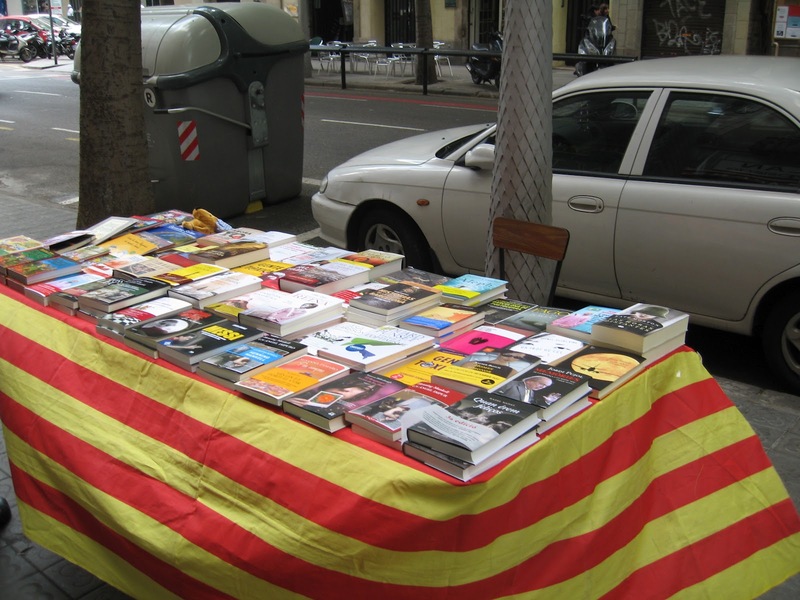 The good thing is that book stalls festooned with the Catalan flag spring up all over the city just for one day which is obviously a marvellous sight. Sadly, closer examination reveals that many of the books are grubby second-hand books about agricultural implements which would never sell at any other time of the year. 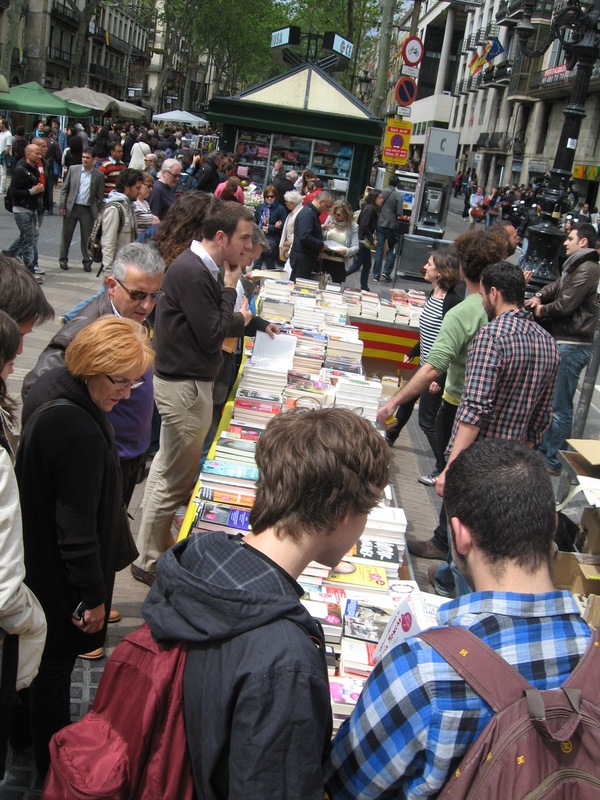 However, the canny stall holders know that many a Montse or a Nuria rushing home from work to their spouse will find themselves bookless and, in desperation, will convince themselves that hubby Jaume would like nothing more than an exhaustive study of hoes of the 1950s. Should you receive such a book it’s probably a sign that the magic isn’t quite what it was. However, I am quibbling. Book stalls are a good thing. 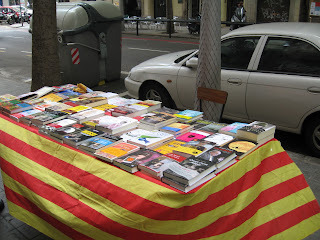 Sant Jordi 2 : A Good Thing! Roses are a thornier issue. Roses, as I was saying, are a thornier issue. San Jordi 3 : The Price Today. Obviously, unless you are from Yorkshire, there is nothing like the sight of large numbers of red roses to gladden the heart and lift the spirits. Unless of course your boyfriend dumped you last night in which case they probably don’t. However, unlike books, roses are vulnerable to being crushed while carried and are also capable of giving you a nasty nick. I’ve seen many a bedraggled bloom on the metro sulkily clutched by a grumpy senorita with a bleeding finger. A timely reminder to us all that love can hurt. And without wishing to harp on it too much the gift rules do seem a bit stereotypical, even sexist. In case you were wondering, this blog is opposed to sexism on the grounds a) that it is wrong and b) that I’m not clever enough to do the formatting and have to rely on a woman to do it for me. Back to the gifts. The man is given the role of the intellectual with his dusty tome while the woman is defined in a more decorative way. But then again expecting gender equality on a day which commemorates the legend of a man who killed a dragon in order to save a princess is probably a bit much. Sant Jordi 5 :This was the closest thing I found to a dragon. 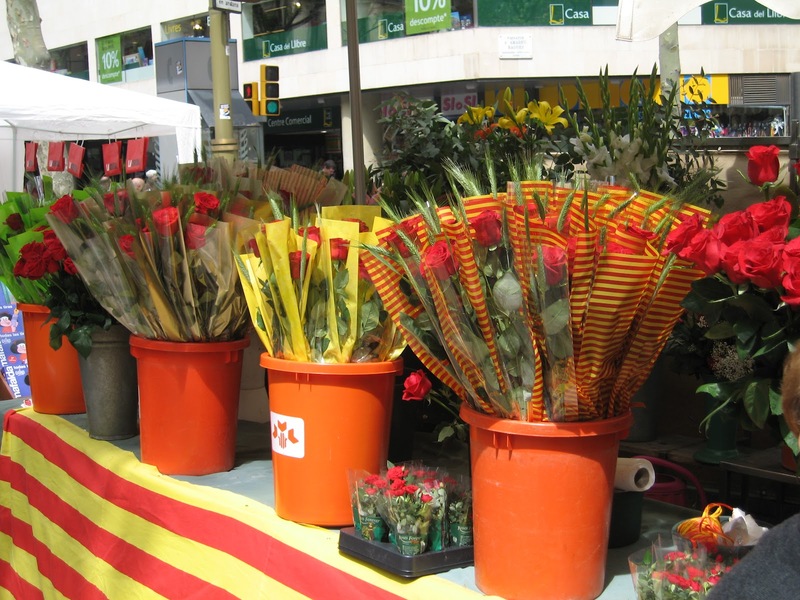 Happy Saint Jordi to one and all! Yo y mi marido/mujer no creemos en los modelos estereotípicos, por eso quisiera comprar un libro de jardinería – My husband/wife and I don’t believe in sterotypical gender roles so I’d like to buy a book about gardening. ¡Dios mio! He olivadado hacer un click en los anuncios. ¡Ahora lo hago! – Goodness me! I had forgotten to click on the adverts. I will do it now!